Approximately 32 million Americans are affected by eye disease which can be traumatic for many. Eye disease is usually accompanied by ailments such as depression, anxiety, and social withdrawal. Diseases such as macular degeneration, cataracts, abnormal binocular vision, glaucoma, and Idiopathic Intracranial Hypertension (which leads to loss of vision) are among those classified as eye disease. As a result, research is being performed for the prevention and treatment of eye diseases. Companies researching and developing new methods of treatment and prevention may be eligible for federal and state R&D tax credits. Eligible costs include employee wages, cost of supplies, cost of testing, contract research expenses, and costs associated with developing a patent. On January 2, 2013, President Obama signed the bill extending the R&D Tax Credit for 2012 and 2013 tax years. As of this writing, both the Senate Committee on Finance and the House Committee on Ways and Means have recommended extension of the R&D tax credit. Macular degeneration, a common eye condition and the leading cause of vision loss among people age 50 and older, is caused by damage to the macula, a small spot near the center of the retina. Responsible for sharp, central vision, the macula enables us to see objects that are straight ahead. It is the most sensitive part of the retina which turns light into electrical signals and sends them through the optic nerve where they are translated into images. Risk factors of macular degeneration include, smoking, race (Caucasian people are more prone to the disease), family history, lack of exercise, irregular blood pressure or cholesterol, and unhealthy diets. Macular degeneration is detected by a comprehensive dilated eye exam which involves a visual acuity test (observation of a standard eye chart) and the manual examination of dilated eyes. When an individual's pupils are dilated, observing the back of the eye becomes much easier. The Amsler Grid is the most common test for macular degeneration. Resembling graph paper, the Amsler Grid lines appear wavy, distorted, or broken when changes in your central vision occur. Fluorescent angiography is another common test which uses fluorescent liquid injected into your arm to observe the blood flow to the retina. This test helps identify leaking blood vessels which occur in a very progressive type of macular degeneration. While your eyes are dilated a doctor may also perform an optical coherence tomography (OCT) in which 3D images are captured in cross-sections of your retina using light waves. This test achieves very high resolution pictures. Figure 1 above illustrates the comparison of normal vision to macular degeneration vision. 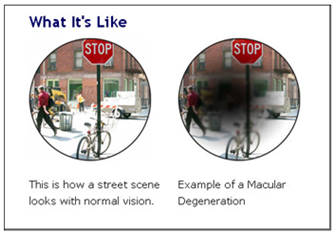 Dry macular degeneration affects approximately 80-90% of macular degeneration patients. The dry type tends to progress a lot slower than the wet type and as of yet, there is no definite and approved treatment. In dry, age-related macular degeneration, small white or yellowish deposits develop on the retina and beneath the macula which cause it to deteriorate over time. The wet form affects approximately 10-15% of individuals with age-related macular degeneration. Despite this fact, wet macular degeneration is the cause of 90% of all cases of severe vision loss from the disease. In the wet form of the disease, abnormal blood vessels under the retina grow toward the macula. Since the new blood vessels are abnormal they tend to break, bleed, and leak fluid which results in the damaging of the macula and causes it to lift up and pull away from its base. As a result, rapid and severe loss of vision tends to occur. The Implantable Miniature Telescope created by Vision Care magnifies images while reducing the size of a blind spot caused by macular degeneration. This FDA approved treatment for macular degeneration required extensive research and development to create. Available as of June of 2012, the Implantable Miniature Telescope is covered by Medicare for those who have central blindness in both eyes that is uncorrectable with glasses. Lucentis is an injectable drug that was approved by the FDA in June 2006 for treating the wet form of macular degeneration and is similar to the cancer treatment drug Avastin. Lucentis inhibits the protein vascular endothelial growth factor (VEGF) The VEGF blockage helps to stimulate the growth of new blood vessels and prevent damaged vessels from leaking fluid. Although strides have been made to improve macular degeneration treatment, further research and development is needed to fully understand the disease and create innovative treatment options. Stargardt disease is another form of macular degeneration that begins to damage both eyes in patients between the ages of 6 and 20, although visual impairment may not be apparent until ages 30 to 40. With this particular disease, vision loss is usually slow until it reaches 20/40 when it begins to rapidly decline to 20/200(legal blindness). In 1997, it was discovered that this disease has a strong genetic component and a family of genes known as ABC1 genes were found to be involved in inheriting this disease. In April 2013, the stem cell development company ACT announced the successful treatment of the first United States patient with Stargardt disease. The surgery was performed at the Wills Eye Institute in Philadelphia by Dr. Joseph Maguire and overseen by Dr. Carl D. Regillo. The patient was injected with 100,000 human embryonic stem cell-derived retinal pigment epithelial cells. ACT also announced the treatment of the fifth and sixth patients in the company's macular degeneration trials. Binocular vision is the use of both eyes together. The advantages of binocular vision are that it provides us a spare eye in case one is damaged and also gives us a wider field of view. Furthermore it gives us binocular summation which is the ability to detect faint objects more easily and increases depth perception. Abnormal binocular vision obstructs the ability for our eyes to work simultaneously. One example of abnormal binocular vision would be having a "lazy eye". Glaucoma is an eye disorder causing harm to the optic nerve, the large nerve that is responsible for vision, resulting in blindness. When an individual has glaucoma, the pressure changes in the fluid circulating the eyeball. This buildup of pressure inside of the eye is associated with optic nerve damage. Damage often occurs when the eyes internal fluid pressure is abnormally high but also can occur if the internal pressure is measured as normal. Glaucoma currently affects about 3 million Americans and is five times more prevalent in African Americans than Caucasians after age 40; however the risk of glaucoma increases with age for persons of all ethnic backgrounds. There are two types of glaucoma, open-angle and acute. Symptoms of open-angle glaucoma include gradual loss of vision and as it progresses, individuals typically notice loss of peripheral vision. Once peripheral vision begins to decline, patients tend to develop tunnel vision, only seeing directly in front of them. In acute glaucoma symptoms occur suddenly and may include having blurred vision, halos around lights during night, haziness in the cornea, pain and redness in the eye, headaches, nausea, vomiting and extreme weakness. 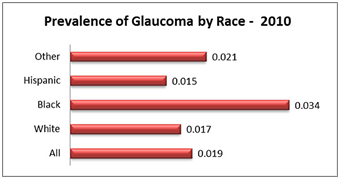 The prevalence of glaucoma by race is illustrated in Figure 2 below. There is a substantial amount of R&D occurring for the treatment of glaucoma. One treatment is the micropulse laser trabeculoplasty (MLT) which promises to provide pressure lowering treatment with minimal side effects. MLT treatment uses a specific diode laser with short bursts of on time and long pauses of off time, the laser can minimize spikes in eye pressure and inflammation that often occur after other laser treatments. In addition to MLT, a canaloplasty is another treatment that is currently being developed. Canaloplasty is a surgical alternative to the common trabeculectomy surgery which can lead to infection, leakage, and irritation. Using the eye's drainage system, a canaloplasty creates a small incision in the eye to insert a microcatheter into the eye's natural site of drainage. This procedure assists in draining fluid to relieve high pressure inside the eye and improve eye sight. A cataract is a clouding of the otherwise clear lens of your eye . In a healthy eye, light can pass through the lens, the clear tissue behind the pupil, and focus on the retina. Typically as a result of aging, cataracts develop and the clear lens becomes cloudy. Once they become large enough, cataracts can interfere with an individual's every day activity by causing vision loss. Symptoms of this disorder are decreased or blurred vision, double vision, seeing halos around lights, or brown spots in visuals. Cataracts can develop with older age or even immediately after birth and are the most common eye disease in the world as Figure 3 depicts. New treatments for cataracts are now emerging such as lens implants used to repair eyes damaged by cataracts. Standard intraocular lens (IOL) implants offer patients improved vision for distance but may not eliminate the need for reading glasses after surgery. Toric intraocular lens implants are for patients requiring correction of astigmatism at the time of cataract. Lastly, accommodative intraocular lens implants provide the widest range of vision from distance to near and minimize the need for glasses after cataract surgery. Idiopathic intracranial hypertension (IIH) is a neurological disorder of elevated pressure in the brain that can result in progressive loss of vision over time. Symptoms of the disorder include headaches in the back of the head which tend to be the worst in the morning or at night. As time progresses the symptoms become more constant and patients begin to suffer from temporary episodes of visual blurring or even blindness. Typically IIH occurs in overweight individuals, especially after a recent weight gain, or even a pregnancy. Certain medications predispose individuals to the syndrome such as the antibiotic Tetracycline, steroids (as the individual weans off), and Vitamin A. The age related eye disease study performed by the national eye institute was initially designed as a long term multi-center prospective study of the clinical course of age related macular degeneration and age related cataracts. The National Eye Institute's study researched the effects of a high dose vitamin and mineral supplements on healthy participants 55-80 years old. Large amounts of data have been studied extensively and have helped in better understanding these diseases. In November of 2010, 72,000 high quality photographs of 595 age related eye disease study participants were made available for research. Lasik surgery is a vision correcting procedure that utilizes a laser. The concerns about the safety of Lasik procedures have increased lately and as a result, many companies are developing new equipment to decrease cost and increase the efficiency of the surgery. 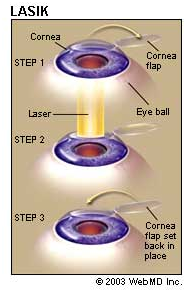 Figure 4 above illustrates the Lasik surgery process. While the traditional Lasik procedure is effective, Dr Rahmani performs a cutting edge advanced version of the surgery. The IntraLasik procedure uses an Intralase computer controlled laser to create a corneal flap. By using the 5th generation, most advanced laser on the market, the procedure provides a new level of safety assurance giving unprecedented control over the laser. Abbot plans to introduce a number of new vision products within the next few years. Being that they are number one in Lasik surgery, Abbot is expanding its vision care presence in markets around the world. Abbot Medical Optics' research and development sector consists of a vision care team that is knowledgeable, experienced and includes scientists, engineers and marketing, sales and technical experts. Despite being heavily involved in the R&D of Lasik surgery equipment Abbot also is involved in cataract treatments. They have developed the TECNIS Toric IOL platform which is a lens that can be used to compensate for corneal spherical aberrations and corneal astigmatism which are a result of cataracts. Bausch and Lomb is another company at the forefront of the eye disease treatment field. Similar to Abbot Medical Optics, they have developed treatments for cataracts and equipment for Lasik surgery. Additionally, Bausch and Lomb has developed a vision shaping treatment. This treatment involves wearing shaping lenses that are custom fitted to the specific contour of your eyes. Every night these lenses gently reshape your eye resulting in improvement of vision. The Bascom Palmer Eye Institute of Florida has contributed to some of the most vital advancements in the modern era of eye disease treatment. 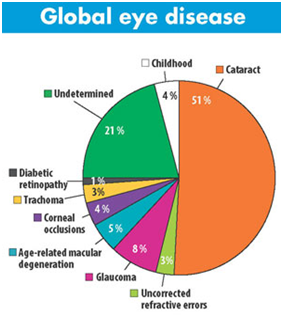 Diseases involving the macula are identified, described and classified, as published in the Bascom Palmer Atlas of Macular Diseases. The institute is also pioneering the use of Avastin which can be used in the treatment of age related macular degeneration. Furthermore, the institute performed the first modified osteo-odonto keratoprosthesis (OOKP) in the U.S., a surgery for the most severe cases of corneal and ocular issues and results in restoring the patient's vision. A recent national study performed by Emory University revealed an inexpensive drug, Acetazolamide, which improves vision for patients suffering from mild vison loss related to idiopathic intracranial hypertension. This National Eye Institute funded research project was conducted at the Emory Eye Center. An estimated 100,000 Americans suffer from IIH and it predominantly affects women of reproductive age who are also overweight. . University of Iowa professor, Dr.Michael Wall, states "results show that acetazolamide can help preserve and actually restore vision for women with IIH, when combined with a moderate but comprehensive dietary and lifestyle modification plan." Researchers at the University of California, San Francisco (UCSF) have found that running assists in the treatment of eyesight loss. UCSF researchers, in a mice study, found that when coupled with visual stimulation, running helped to restore the animal's brain functions that were associated with sight. Mice with poor eyesight in one eye were given a regimen of running and visual stimuli exposure which resulted in significant improvements in their vision. This study may possibly lead to treatment for certain eye disorders such as a cataract in a single eye or a droopy eyelid. The University of Maryland has been researching a few treatment options for cataracts. Wearing UV protection sun glasses and keeping healthy lifestyle habits are essential to preventing the disease and some medications help delay cataracts from forming, especially for those with diabetes or other high risk conditions. There are drug therapies available for vision treatment include eye drops that contain phenylephrine and homatropine which are prescribed to dilate pupils and provide enhanced vision and aldose reductase inhibitors which help to prevent and delay cataracts in patients with diabetes. In addition, antibiotics and steroid eye drops may be prescribed after cataract surgery. There are also some surgical procedures that can help after the early stages of cataracts to help replace the cloudy lens that is formed. In 2013, researchers at the University of North Carolina (UNC) studied new and more effective treatments for macular degeneration. MDM2, a UNC developed drug, has conceivable advantages over other treatments that are being investigated. Radiation treatment can be used but also causes DNA damage in cells leading to cell death. MDM2 on the other hand, helps to activate p53 (a master regulator which determines if a cell lives or dies) without causing DNA damage. Eye disease can have serious effects on an individual's life. Research and development strides are being made for all eye disease which is resulting in more effective and advanced treatments. Efforts to innovate treatment and prevention of eye diseases can be aided by the federal and state R&D tax credits.